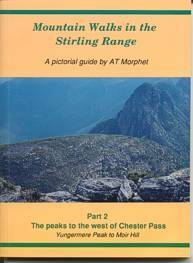 Of the 34 named peaks in the Stirling Range, these two guide books describe walking routes to the top of 25 of them. The Peaks not covered are those that lie within the special dieback protection areas, to which access is restricted. While some of the walks follow well formed tracks, many follow vague trails over rough and steep terain. Detailed drawings and diagrams in the books help to clarify routes up confusing rocky peaks; however, some degree of competence in navigation is still required by the walker. 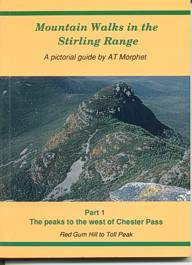 This book covers the peaks to the west of Chester Pass. Many of the firebreak tracks used in this book to gain access to some of the scattered peaks, have become overgrown and difficult to follow. Nevertheless, the routes up Mount Magog and Talyuberlup Peak are still current. Mondurup Peak is now closed to walkers. Part 2 covers the peaks to the east of Chester Pass and not, as stated on the cover, the peaks to the west. Bluff Knoll and the tough high level route along the ridge from Bluff Knoll to Ellen's Peak, known as the Stirling Ridge walk, are covered in great detail. Since publication of the book the access to the far eastern end of the walk has been changed. Details of this change can be found by following the links to the Stirling ridge walk.